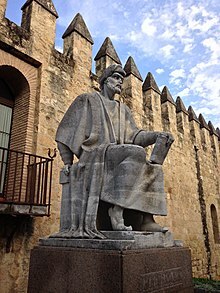 The Incoherence of the Incoherence was written by Ibn Rushd (statue in Córdoba, Spain). The Incoherence of the Incoherence (Arabic: تهافت التهافت‎ Tahāfut al-Tahāfut) by Andalusian Muslim polymath and philosopher Averroes (Arabic, ibn Rushd, 1126–1198) is an important Islamic philosophical treatise in which the author defends the use of Aristotelian philosophy within Islamic thought. It was written in the style of a dialogue against al-Ghazali's claims in The Incoherence of the Philosophers (Tahāfut al-Falasifa), which criticized Neoplatonic thought. Originally written in Arabic, The Incoherence of the Incoherence was subsequently translated into many other languages. The book is considered Averroes' landmark; in it, he tries to create harmony between faith and philosophy. In The Incoherence of the Philosophers, the Sufi-sympathetic imam al-Ghazali ("Algazel") of the Ash'ari school of Islamic theology argued against Avicennism, denouncing philosophers such as Avicenna (ibn Sina) and al-Farabi (Alpharabius). The text was dramatically successful, and marked a milestone in the ascendance of the Ash'ari within philosophy and theological discourse. It was preceded by a summary of Neoplatonism titled Maqasid al-Falasifah ("Aims of the Philosophers"). Averroes' response defends the doctrines of the "philosophers" and criticizes al-Ghazali's own arguments. It is written as a sort of dialogue: Averroes quotes passages by al-Ghazali and then responds to them. The Incoherence of the Incoherence was not well received by later Islamic scholars. In the 15th century, a strong refutation of Ibn Rushd's arguments was written by an Ottoman scholar, Mustafá ibn Yūsuf al-Bursawī (d. 1487, also known as Khwājazāda), defending al-Ghazali's views. In Europe, on the other hand, ibn Rushd's philosophical writings were generally well received by Christian and Jewish scholars and gave rise to the philosophical school of Averroism. This page was last edited on 5 February 2019, at 01:35 (UTC).